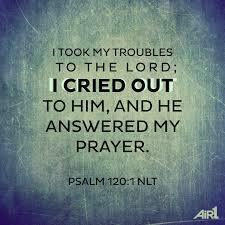 Psalm 120:1 says I took my troubles to the Lord; I cried out to him, and he answered my prayer. So many of us think that we can do everything on our own when in reality we can’t. God is the only solution and answer to our troubles and request. As we go through this week I just want us all to reflect on this verse and remember that if we cry out to the Lord, He will answer us. It might not be a quick instant message reply, but when He believes we are ready for the answer He will give it to us. And if you have a testimony or interpret this verse another way please share so that we can encourage one another along our journey. To me this verse makes me think of the trials and tribulations that I face everyday. It gives me assurance that when I call on the Lord in my time of need, He will basically answer my call. The Lord is on the midst of all our distresses. He is just waiting on me to call on Him.